Part One. Preliminaries: Approaches to the Study of Expertise. 1. Motor experts: Opening thoughts (J.L. Starkes). 2. Cognition, expertise, and motor performance (F. Allard). 3. The role of three dimensional analysis in the assessment of motor expertise (H. Carnahan). Part Two. Domains. 4. Determinants of video game performance (D.M. Baba). 5. Analyzing diagnostic expertise of competitive swimming coaches (R.R. Leas, M.T.H. Chi). 6. Declarative knowledge in skilled motor performance: By-product or constituent? (F. Allard, J. Deakin, S. Parker, W. Rodgers). 7. The relationship between expertise and visual information processing in sport (W. Helsen, J.M. Pauwels). 8. The perceptual side of action: Decision-making in sport (C.J. Chamberlain, A.J. Coelho). 9. Knowledge representation and decision-making in sport (S.L. McPherson). 10. Neuropsychological analyses of surgical skill (A.L. Schueneman, J. Pickleman). 11. The skill of speech production (K.G. Munhall). Part Three. Acquisition and Developmental Aspects. 12. A stitch in time: Cognitive issues in microsurgery (J.L. Starkes, I. Payk, P. Jennen, D. LeClair). 13. Motor expertise and aging: The relevance of lifestyle to balance (M.J. Stones, B. Hong, A. Kozman). 14. The development of expertise in youth sport (K.E. French, M.E. Nevett). Part Four. Theoretical Considerations and Evaluations of the Approach. 15. A modular approach to individual differences in skill and coordination (S.K. Jones). 16. Three legacies of Bryan and Harter: Automaticity, variability and change in skilled performance (T.D. Lee, S.P. Swinnen). 17. Strategies for improving understanding of motor expertise (or mistakes we have made and things we have learned!!) (B. Abernethy, K.T. Thomas, J.T. Thomas). Part Five: Editor's Epilogue: Where Are We Now? Author index. Subject index. The intent of this book is to describe those perceptual and cognitive components which contribute to skilled motor performance in a wide variety of disciplines, including sports, microsurgery, video games, and speech. Also considered are issues in the measurement of motor skill, the development of motor skill across the life span, and the importance of individual differences in the development of motor skill. 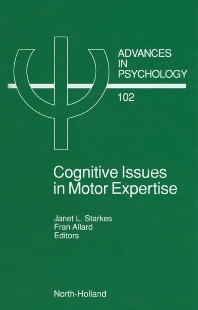 Many chapters contain studies employing the expertise approach used so successfully to study cognitive skills in psychology. Using this approach, expert performers are compared to novices on domain relevant laboratory tasks in order to determine whether specific cognitive or perceptual processes are related to performance differences. This volume will be of value to kinesiologists, sport psychologists, physical educators, and cognitive psychologists who are interested in a new perspective on the nature of motor skills. The majority of the chapters include reviews of the literature necessary to understand the case being made. Thus, the book may be understood by any reader with a basic course in psychology or motor behavior.